What colors! And what a glorious day it must have been to be out shopping at the mall! You'll find Old Orchard's (Westfield) website right here. Looks like it was a nice mall. Great pics, tannerman. Guess they'll tear it down and build a Loews or Home Depot. Great photo! Where did you find this? Are there more like it? I grew up around this mall, and my mother moved to the area around the time this must have been taken. Old Orchard was brand new at the time, and has since been remodeled extensively. The parking lot you see in the foreground is now a food court and additional retail stores. The store is slated to convert to Macy's next fall. I would love to see more historical photos if they are available. This is driving me crazy but was Barnes & Noble the original bookstore at Old Orchard. 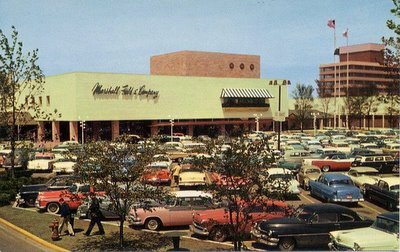 I grew up going to this mall in the 70s and early 80s. For the life of me, it seems like the bookstore had a different name. Having a hard time believing I can't remember what that name was but I'm almost certain it wasn't B&N!!!! !